Looking like a man who'd been CEO of a major corporation for years, not just hours, Satya Nadella answered a range of questions during a sit-down/webcast at Microsoft's headquarters this afternoon. He stayed high-level, but among Nadella's polished responses was a glimpse at what the newly appointed chief exec plans to prioritize first. "Both internally and externally, there's a lot to learn," Nadella, who's described himself as a lifelong learner, said. "I've spent a lot of time in Microsoft, but there are also parts of Microsoft that are going to be new to me. We have Nokia joining our company once the deal's closed, so therefore there's definitely a lot to learn for me." He said he'd be focusing on spending time with three constituent groups: customers, partners and investors. Nadella will hit the road, and have his "best listening skills" turned on. Making sure the company is in touch with perceptions and being grounded in reality is "what's going to help us do our best work going forward." Nadella said he won't be starting from scratch with the path Microsoft has put itself on, though there is still work to be done. "The strategic frame that we have around devices and services is great," he said. "We're not waiting for our entry into a mobile-first, cloud-first world. We are there ... But one of the thing we also want to do is get more specificity and more focus on what it is we can uniquely do." 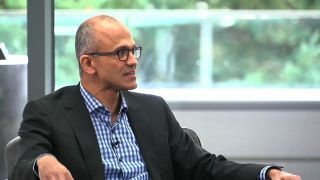 Nadella reiterated many of the themes from his email to employees and post on Microsoft's website. He talked about the malleable power of software, an industry that places innovation over tradition and how critical Nokia and Surface are to Microsoft's future strategy. "Devices are where [software] experiences come together," he said. With Nokia under its wing, Microsoft will be able to "bring the core capability that we have with Surface and Xbox, [and] encapsulate these experiences." Repeating a phrase that has taken on the ring of Microsoft's new anthem, Nadella said "mobile-first, cloud-first" will define Microsoft. In speaking about mobile, Nadella noted that the term has been skewed towards mobile phones. However, because of evolutions like the industrial internet and Internet of Things, Microsoft is building for a world connected by data and the cloud that's "mediated by software." Thanks to a heritage of software that is "still very relevant," Microsoft has the groundwork to move forward. "We have to do new things," Nadella said, "but we should be very, very confident in our capability around software as it comes to these new experiences."